Honestly, we all have moments where we need to vent out our frustrations. It is therapeutic to let it out, especially to people who understand (fellow coworkers and friends). It happens to all of us and it is completely normal to feel frustrated, overwhelmed, and alone as a teacher. But there is a very big difference between having a rough day and needing to vent, and being a Negative Nancy all. the. time. about all. the. things. Here are some tips from veteran teachers in Mrs. D’s VIP Facebook group to help you cope if you have a Negative Nancy Teacher down the hall. To start out, kill the negative teacher with kindness, “even if you are doing it through gritted teeth” and a fake smile. Truthfully, rude and ignorant people need kindness the most. Second, you know how when we call parents or are in IEP meetings, we do the positive-negative-positive sandwich? Time to use that here too… for every negative comment Negative Nancy spews, try and fill the conversation with two positives. If you can’t think of two, verbally hit her back with at least one positive. You can, also, empathize with how she’s feeling by saying something like, “I have noticed that you are frustrated with [XYZ], what can I do to help?” Then find a way to turn every negative comment into a problem that can be fixed with a solution (because, truthfully, every problem has a solution). Social cues can be helpful in times like these as well, like ignoring the negative comments and redirecting the conversation to something else. If you want to come off as more understanding, you can say something like “thank you for sharing your opinion/point of view”, and then change the subject. Try and stay positive, I know it’s tough. You may find that with Negative Nancy, you hold a strictly professional relationship. Nothing wrong with that. You may not be able to control someone’s negative behavior, but you can control how long you participate in it. If killing Nancy with kindness doesn’t seem to be working, or she isn’t picking up on your social cues that you don’t mess with negativity, avoid. Avoid her like the plague. Only interact with Nancy when absolutely necessary. Lastly, draw the line at gossip. If the problem has an actionable solution that can be changed, tell Nancy to get involved. Whether that means to speak with an admin, have a conversation with the colleague or parent, go to a Board Meeting, join the Union, or get involved some other way… tell her to do it. Teachers have the power to make change, but negative words don’t change anything. Do your best to be Nancy’s friend. At the very least, offer your encouragement without judgement. We all come into teaching with different experiences and we all face similar, but different, challenges. This goes back to being empathetic and offering solutions. 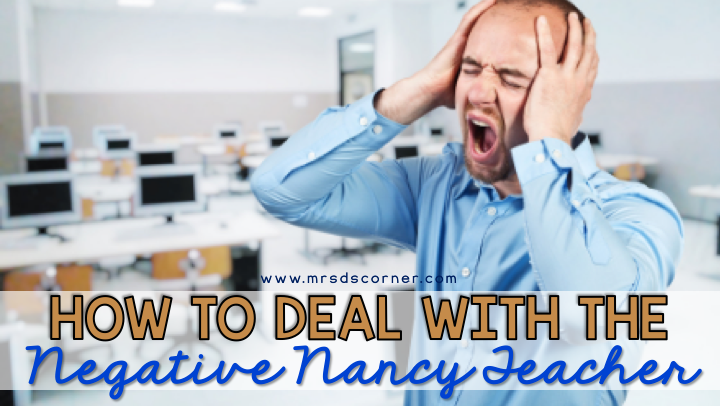 BUT if Nancy is the type of person to complain and you offer solution, solution, solution, and Nancy doesn’t listen… try one of the tips from above. On the flip side, if Nancy had a rough day yesterday, take 2 minutes of your time today to check in on her. See how she’s doing and if she needs anything. Offer her chocolate, or some sort of treat. 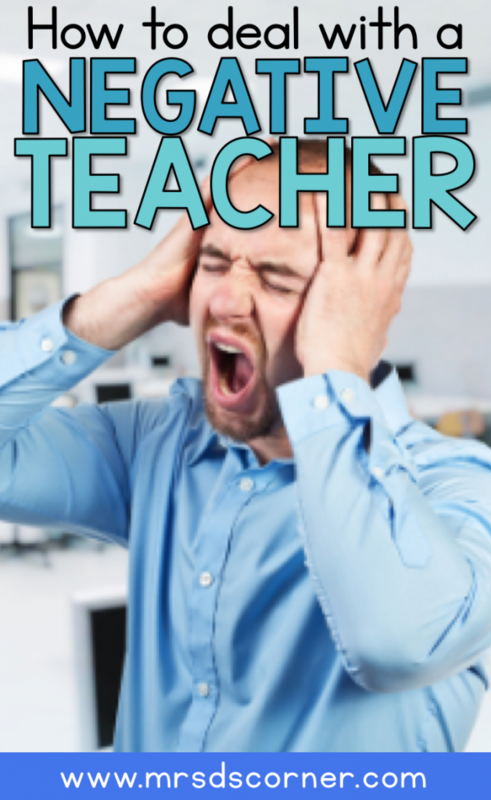 What tips for dealing with a negative teacher do you have? Let us know in the comments below!